Labor Secretary Thomas Perez said to expect a redraft "in the coming months" while announcing a plan to require 401(k) fee disclosure guides. Labor Secretary Thomas Perez said Tuesday that the Department of Labor would release “in the coming months” its fiduciary redraft, stating that it was a “very important rule” and that DOL would continue its “due diligence” on the rulemaking. 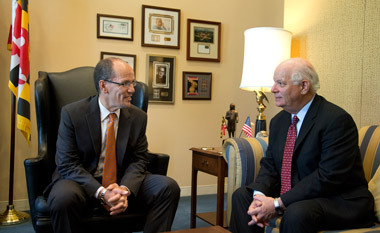 Perez confirmed that the DOL was indeed moving ahead in reproposing its rule to amend the definition of fiduciary under the Employee Retirement Income Security Act — what he called the “rule to reduce conflicts” in the retirement marketplace — during a conference call with reporters to announce a newly proposed rulemaking regarding a 401(k) fee disclosure guide. While there has been speculation in the retirement planning community as to whether DOL would indeed move ahead on the rule this year, DOL stated in its regulatory agenda its revamped rule would come in August. The fee-disclosure guide plan would amend DOL’s rule 408(b)(2) to “require covered service providers to furnish a guide to assist plan fiduciaries in reviewing the disclosures required by the final [408(b)(2)] rule if the disclosures are contained in multiple or lengthy documents. “This amendment will affect pension plan sponsors and fiduciaries and certain service providers to such plans,” DOL says. DOL says such a guide “would help employers navigate sometimes complex and lengthy fee disclosures provided by companies that manage 401(k) type retirement plans.” These disclosures were mandated by a 2012 final rule published by the department’s Employee Benefits Security Administration. Phyllis Borzi, head of EBSA, said during the conference call that when EBSA issued its final 408(b)(2) regulation, EBSA said that it would be “watching the implementation” of the rule. “We are particularly concerned that small employers that are fiduciaries may not be getting the full benefits of the fee disclosure regulation,” she said. Borzi says the proposal comes in two parts. First, EBSA is proposing to require service providers to provide plan fiduciaries with a roadmap so that they can determine the compensation of the service provider, any recordkeeping fees, the service provider’s sources of income, as well as payments to third parties. “We are suggesting that the guide has to identify the document where this information is disclosed, and even the page number, so that the information can be found quickly,” she said. The proposal has a 90-day comment period. The second part of the plan includes EBSA engaging a contractor to conduct “targeted focus groups with small employers to get feedback about their experiences” with the new 408(b)(2) rule, Borzi said. She said the focus groups should “provide valuable information” on whether there should be a guide. Check out Is DOL Fiduciary a ‘Solution in Search of a Problem?’ Consider the Data on ThinkAdvisor.